Who wants to study parts of speech? Your students will with this FUN! and EFFECTIVE! game. This resource will allow your students to identify 45 of the most common prepositions by sight. Know the prepositions and you have a better grasp of the language and its mechanics! These cards are in black and white for your printing convenience, but they look amazing when printed on colored copy paper. • Please go to your My Purchases page (you may need to login). Beside each purchase you'll see a Provide Feedback button. Simply click it and you will be taken to a page where you can give a quick rating and leave a short comment for the product. I value your feedback greatly as it helps me determine which products are most valuable for your classroom so I can create more for you. • Look for the green star near the top of any page within my store and click it to become a follower. You will now receive customized email updates about this store. Would you like a FULL CLASSROOM, 30-card version of this game? 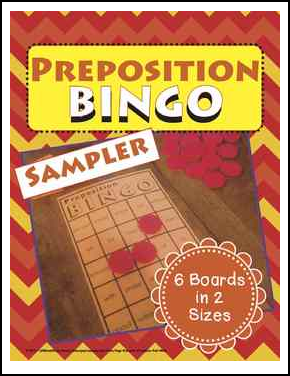 Look no further than the Parts of Speech Expanding BINGO Bundle, which includes the FULL version of this game plus 4 more Parts of Speech BINGO sets (see below for links to each of the games included in the bundle or to purchase separately).